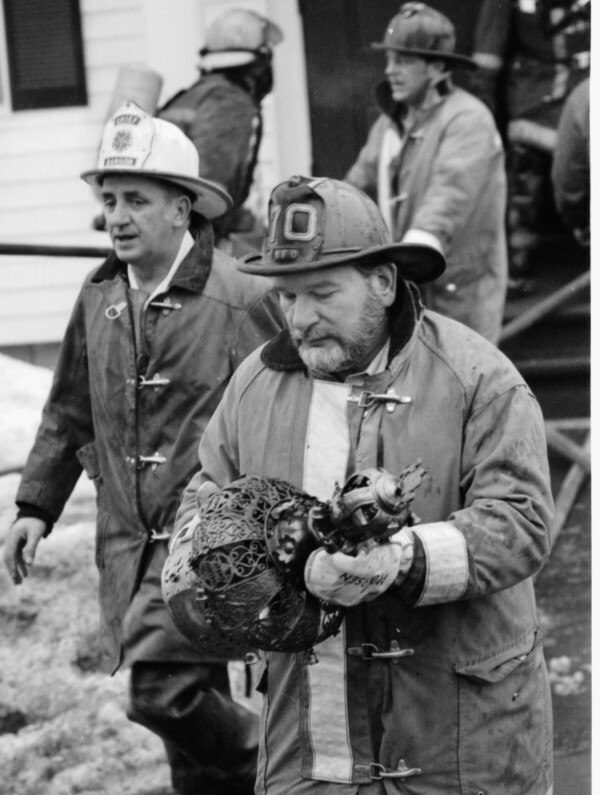 BANGOR DAILY NEWS PHOTO BY JACK LOFTUS Donning a fireman's hat and coat, Rabbi Henry Isaacs entered the burning Beth Abraham Synagogue in Bangor on Wednesday morning to save a silver crown which adorned the top of a Torah scroll. At left is Bangor Fire Chief Robert Burke. ORONO — Chris Frank, a University of Maine graduate student, believes that someday history buffs will be able to hold the secrets and statistics about every building in the world right in their hands. Every structure, from its year of construction to its current status, will be on a gadget that fits in the palm, relayed to the device from dozens of databases via satellite technology. Point it at a structure and up on a screen will appear information about its architecture or tidbits about events that occurred within its walls. Pictures, too. Sightseers will just need to go to a hotel lobby, rent the device for $15 a day, and then they’re on their way. BANGOR — Stop by ChristianNetcast.com headquarters on Washington Street in Bangor and what you see is what you get: a suite of not too fancy offices used by a small, tightknit staff. What you hear is something else: ChristianNetcast.com is currently the nation’s largest provider of radio Web “streaming” technology to Christian radio stations and churches. That kind of technology allows Web users all over the world to listen to Christian music and services online. Not bad for a business that began in a garage in Newburgh. Mike Elliott, vice president of programming development and a Houlton native, had the idea for ChristianNetcast.com after he returned to Maine in 1997 after a successful radio career in major markets in Arizona, Ohio and Florida in the 1980s and 1990s. He still spends his morning co-hosting the popular radio show “Mike and Mike” on WKSQ-FM (94.5) in Ellsworth. ORONO — The Normand C. Dube Writers Fund has been established to support the work of writers, researchers and students in Franco-American studies. Dr. Normand Dube, who died in August 1988, was born in Van Buren. Devoted to Maine and its Franco-American population, he spent much of his professional life teaching in Lewiston, at the University of Maine, and in various schools. EAST CORINTH — Pearl Buswell celebrated her 90th birthday Jan. 4 at home on Bean Mills Road in East Corinth. A lifelong area resident and former teacher, she worked for 20 years in the Corinna Woolen Mill. She has been a widow since her husband of 40 years, Maurice Buswell, died in 1962. She has three grandchildren, seven great-grandchildren and two great-great-grandchildren. She enjoys writing to friends and remembering shut ins. BANGOR — Believe it or not, check books have become fashionable in the Bangor area. Unlike the plain, conservative, black covered checkbooks, local banks are selling glamorous and highly sophisticated checkbooks in a wide array of colors for fashion conscious women. Merchants National Bank, the oldest bank in town, has given into the modern trend in checkbooks, and has a selection of various colors featuring antique white. The specialty of the house is alligator. Of course it is only a plastic finish, but many are convinced that it is real reptile. J.C. Hall of Providence even provides one in Mink, but of course a price tag is attached to it. BANGOR — How accurate is the weatherman? Based on 1964, the much-maligned weatherman was surprisingly accurate, at least so far as The NEWS was concerned. Throughout the year, The NEWS each day compared the prediction as printed on page 1 with the actual conditions for that day. The printed prediction was correct 68 percent of the time. BUCKSPORT — We were visited Thursday morning by one of the worst storms of the season. The wind blew a gale and the rain came down in torrents. The Stockton started out on her trip for Camden but after going a short distance turned back, arriving here about 10 in the forenoon. BANGOR — Notwithstanding the severe rainstorm on Thursday the attendance at the Bangor Poultry Show was larger than any other day at any show ever held by the society, exceeding even the record-breaking attendance of Wednesday. However, the storm no doubt held down the receipts for the day and the offices of the society expect that a large number who they hope will attend today will help out the total receipts. A large bronze turkey near the center of the left-hand side of the hall is a very interesting part of the show. He is a very large bird of beautiful plumage and is the admiration of all who have seen him. By his side is a large white turkey, which was entered by Mrs. F.H. Strickland, and is well worthy of close inspection. On the front of the stage may be found for pens of excellent birds, the property of John Scott. They are Brahmas, Black, Buff and White Orpington’s. A feature of these exhibits of the cleverly constructed with pens of woven wire, in which they are kept. BANGOR — Two seizures of liquor were made by the police on Thursday — one in a shed in the rear of 119 Exchange St., netting 15 gallons of the alleged whiskey. There did not seem to be any person resembling a possible owner on the premises and it is a safe wager that no one will rush to the police station to claim the goods, with the prevailing atmosphere of $100 and costs and 60 days in jail about the Municipal Court. Another seizure was made in a hide under the stairs in a hallway on the second floor of the building at 113 Exchange St. A wire nail applied to a magic spot was the means of unearthing the hiding place. Sixteen bottles of brandy, one of rum, 19 pints and nine half-pints of whiskey were found. BANGOR — An advertisement: Eastern Maine Steel Ceiling Company wants the public to know that metal ceilings are particularly adapted for use in dining rooms, living rooms and conservatories, but are well suited to other rooms — and they are artistic. Metal ceilings are rapidly gaining favor for use in residences. We will be pleased to furnish free estimates and drawings, without obligation, in order to show you the economy of the artistic value. We have a large stock at our Bangor office to select from. E. F. Barker, manager, 96 Harlow St.